We have an Android on Android smartphone fight for your viewing pleasure below, pitting the Samsung Galaxy S2 up against the HTC Sensation 4G in a face-to-face two-part comparison video to see if we can find out which of these two Android is the must own handset. 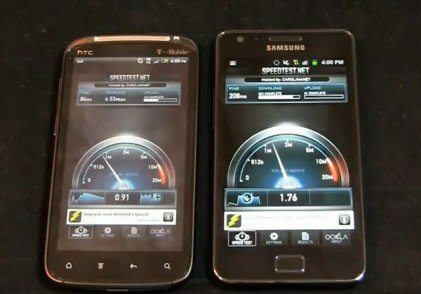 The two-part Samsung Galaxy S2 against the HTC Sensation 4G dogfight video comes our way courtesy of Aaron Baker over at Phone Dog and combined delivers twenty-nine and a half minutes of Android confrontation. In the blue corner we have the Samsung Galaxy S2 with its 1.2GHz dual core Exynos processor 4.3-inch Super AMOLED Plus touch screen, 8 megapixel camera, 1080p video, front facing camera and running Android 2.3 Gingerbread. In the red corner we have the HTC Sensation 4G with its 1.2GHz dual core Snapdragon processor, 4.3-inch qHD touch screen, 8 megapixel camera, 1080p video, front facing camera and again Android 2.3 Gingerbread. Thus this battle is virtually a like for like confrontation but the big question remains, which of these two Android giants can come out victorious? Well to find our head on down and punch those play buttons to see if you agree with the outcome…enjoy.